Want to lower drug prices? Let Medicare negotiate. 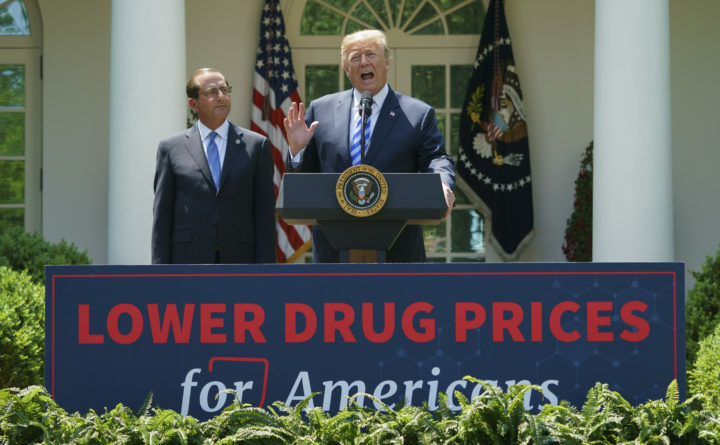 President Donald Trump speaks during an event about prescription drug prices with Health and Human Services Secretary Alex Azar in the Rose Garden of the White House in Washington, Friday, May 11, 2018. The price of brand name drugs have increased nearly 300 percent since 2010. The price of one drug used to treat multiple sclerosis increased by more than 3,000 percent, a recent study found. Because of the high cost of prescription drugs, many Americans don’t take their medication as prescribed, which can worsen their symptoms and delay recovery. So, it is no surprise that drug prices are a top concern for many Americans. On the campaign trail, President Donald Trump said lowering drug prices would be a priority if he were elected. In his first news conference as president-elect, he accused drug makers of “getting away with murder.” He said Medicare, the largest single purchaser of medications in the U.S., should be able to negotiate for lower drug prices. This is currently against the law. On Friday, Trump unveiled his plan to lower drug prices. Allowing Medicare to negotiate lower medication prices was nowhere to be found. Instead, his plan included numerous small steps that aren’t likely to do much to reduce drug prices. They include possibly requiring drug makers to disclose the cost of the medicines on television commercials, speeding up the approval process for over-the-counter medications and lifting the “gag” rule that prevents doctors from telling patients how they can save money on medications. Trump’s health and human services secretary, Alex Azar, is a former executive at Eli Lilly and Co., a drug maker. Pharmaceutical company stock prices rose after Trump’s announcement, signaling that investors don’t believe the steps the president outlined would cut into these companies’ high profits. In Maine, lawmakers recently took an important step toward lowering drug prices. A first step in reducing drug prices is to let consumers know the cost of medications they are prescribed. Next, drug makers should explain how they set prices. LD 1406, which became law earlier this month, without Gov. Paul LePage’s signature, does both of these things. It requires that the Maine Health Data Organization, starting Dec. 1, issue a report detailing: the 25 most frequently prescribed drugs in Maine; the 25 costliest drugs as determined by the total amount spent on those drugs in the state; and the 25 drugs with the highest year-over-year cost increases as determined by the total amount spent on those drugs. This is for both generic and brand-name medications. It also requires the organization to develop a plan to collect data from manufacturers related to the cost and pricing of prescription drugs in order to provide transparency in and accountability for prescription drug pricing. It is also directed to consult with other state and national agencies and organizations to determine how best to do such data collection. Other states for example, are requiring information about marketing and advertising costs and research and development costs. The bill’s sponsor Eloise Vitelli, D-Arrowsic, shared the story of a young colleague who has had diabetes since she was a toddler. She pays nearly $5,000 a year for insulin, a pump and monitoring and testing supplies. This is with insurance. The cost of insulin has increased by more than 50 percent in four years. “When individuals begin to make choices between taking a life sustaining drug or buying food and paying rent, we know we have a problem that cannot — should not — be solved by individuals themselves,” Vitelli told the Judiciary Committee last May, when the bill was introduced. The bill was held over from last year to give lawmakers time to work out a compromise. Despite opposition from the pharmaceutical industry, the bill was unanimously passed by both the House and Senate, showing that lawmakers can address problems when they work together. In Washington, it now falls to Congress to take up Trump’s broken promise to allow Medicare to negotiate lower drug prices. This will be a difficult sell if Republicans retain control of Congress, but common sense dictates this is one of the most direct ways to lower drug costs for tens of millions of Americans.